From la Rochelle this cycling tour takes you along the Atlantic coast to discover the Charente Maritime area. You will ride along the Velodyssey to discover many islands as Ile de Ré or Ile d’Aix but also wide sandy beaches, marshes, oyster farms... small roads through the Haute-Saintonge and Haute Gironde to meet the wine-makers of the famous “Cognac” and “Pineau” of Charentes, by superb Romanic churches, caves and some unique Gallo-Romanic sites. Discover small ports on the estuary, stroll in charming villages. This tour combines bicycle paths through forests and flat roads alongside streams, vineyards and cliffs. This is a discovery of the exceptional natural surroundings which will fulfil yourself with its diversity. Everyday your hosts will warmly welcome you in 3 or 4 stars hotels and charming guest houses. Arrive at your 4-star hotel in La Rochelle, where you will find the road book and bikes waiting for you. “La Rochelle” is a tourist and lively city, remarkable for its history. You can appreciate the old harbor and its towers which kept it the entrance from XIIIth century to XVth century. You can also enjoy the city centre and its arches as well as the town hall from the XVh century. Overnight in a 4-star hotel. Breakfast included. Loop tour to the island of “Ré”, passing through the villages of “Flotte en Ré” (dating from the 18th century) and its fortress. Walk along the oyster beds, salt marshes and the nature reserve of the “illeau Niges”. Back by “La Couarde” and “Bois plage”. 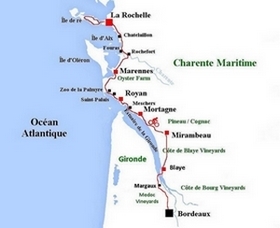 Today’s cycle takes you alongside the coast and through the lively cities of “Chatelaillon” and “Fouras”. Your itinerary then continues by the natural reserve of the Yve’s Bay. In Fouras,you can take the ferry to the Island of Aix which was the last pension of Napoleon 1st. Before arriving in “Marennes” the path takes you through “Rochefort”. This city founded in the 17th century around shipbuilding where you will discover the original and unique Eiffel transporter bridge. The route continues on bike paths of the most beautiful coast of Western France. You itinerary takes you on the cycle path to go through the pine forest of the wild coast called the “Palmyre” where you can visit the zoo. It is easy to observe the animals. Arrive into “Royan” by Saint Palais, the beaches of Vaux sur Mer, Pontaillac, and the marina. It is a stage marked by the strong perfume of maritime pines. Royan is a modern resort city that hides some beautiful villas, an original covered market and a festive and lively waterfront. Leave Royan by taking the boulevard Garnier and its beautiful villas from the 19th century. Continue at the top of the cliffs with an amazing view over the estuary. The place hides charming little wild ports. Discover Talmont-sur-Gironde, its church and blooming streets, the craftmen village of cave dwelling dug in the limestone cliffs of Meshers-sur-Gironde. The Park of the estuary is the Nature Area of Charente Maritime. Ride across a forest overlooking the ocean and the estuary , but also the old capital of Caviar, with its port almost located in the centre of the village. Continue by Mortagne-sur-Gironde, its fishing and sailing port make it a unique site in the area. Overnight in a charming guesthouse. Dinner and Breakfast included. Ride along the Estuary on a very nice cycling path between marshes and dykes until Vitrezay, the gateway to Gironde. After a visit to the «Terres d’Oiseaux» bird sanctuary, a beautiful «Voie Verte» cycle track leads to the Blaye Citadel, built by Vauban and listed by UNESCO (alongside Fort Pâté and Fort Médoc) as the Vauban lock”.A ferry crosses the estuary from Blaye to Lamarque the next day. Discover Blaye and its famous citadel built by Vauban and take the ferry ! Your cycling day continue on the Médoc side in the heart of the Margaux and Haut Médoc vineyards. 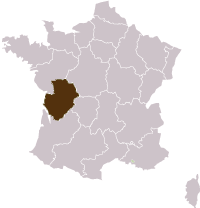 The Garonne River and the estuary of the Gironde mark profoundly the landscapes, through swamps, banks and small ports. There are so many spaces of discovery of the fauna and flora, the islands and the plaices. Through little roads continue towards Bordeaux, Unesco World Heritage. Accommodation with breakfast in 3 or 4-stars hotels and charming guest houses. 1 dinner (drinks not included)). Dinners in La Rochelle, Marennes, Royan, Blaye and Bordeaux. Starts in : La Rochelle.